Pretty Good Solitaire is a collection of 1000 solitaire card games, from classic games like Klondike, FreeCell, and Spider, to original games found nowhere else. Pretty Good Solitaire contains a solitaire game for every mood. Whether you want an easy, mindless game or an intellectual challenge, you will find it here. Pretty Good Solitaire is easy to play, giving you the choice of the standard drag and drop or its unique quick right button mouse clicks to move the cards. Don't settle for just being able to undo one move again, with Pretty Good Solitaire you can undo every move and redo them again if you wish. Leave a game while it is in progress and Pretty Good Solitaire will save it for you - when you enter that game again it will play the game back for you to where you left off. You can submit your statistics to the web site and see how you rank against other players. Pretty Good Solitaire has large and beautiful easy-to-read playing cards and lush backgrounds that make playing solitaire a visual delight and you can download additional cards as well. You can change the background to any color or any image. If you can't decide which game to play, Pretty Good Solitaire can select a game at random for you. 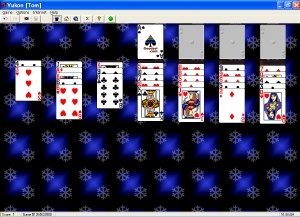 You can even create your own solitaire games with the wizard! For an extra challenge, climb the levels of a quest by winning games and try to get the highest score! Warning: Pretty Good Solitaire may be addictive. We are not responsible for lost productivity, neglected spouses, children, or pets. We are not responsible for lost sleep because you stay up to play "just one more game". Pretty Good Solitaire makes solitaire more fun!